The Journal of International Commercial Law (George Mason) is looking for one more article to publish in its Fall 2015 Issue, as well as looking for articles for its Spring 2016 Issue.The submission deadline for the fall issue is Oct. 31, 2015. There is no deadline for the spring issue. The Journal of International Commercial Law seeks to publish articles and essays making a significant, original contribution to the area of international commerce. 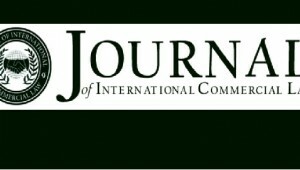 The Journal considers articles from a wide array of topic areas relating to international commerce, including insurance, intellectual property, commercial litigation, and conflict of laws, as well as the international sale and transfer of goods and services. Please refer to our previous issues for examples of pertinent topic areas. They can be viewed under the “Issues” tab at http://www.georgemasonjicl.org.